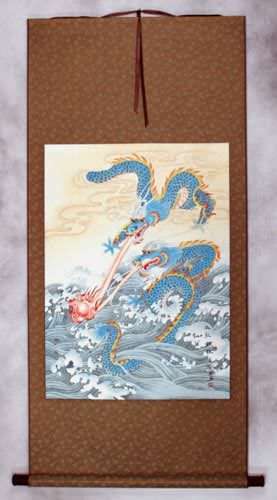 Buy a Self-Control calligraphy wall scroll here! The short and sweet version of self-control. Note: This can also mean self-restraint. 自己抑制 has a meaning like "to restrain oneself" in Chinese, Japanese, and old Korean. The first two characters mean "regarding oneself," and the second two mean "to refrain" or "to restrain." 克己 / 剋己 can be translated as "self-denial," "self-abnegation," "self-restraint," "self-discipline," "self-mastery" or selflessness. As a tenet of Korean taekwondo, and other martial arts, this is often used with the title "self-control." 意志力 is the form of will power or self-control is about having the determination or tenacity to keep going. In Japanese, this is the power of will, strength of will, volition, intention, intent, or determination. 自律 means self-discipline and self-control. It is doing what you really want to do, rather than being tossed around by your feelings like a leaf in the wind. You act instead of react. You get things done in an orderly and efficient way. With self-discipline, you take charge of yourself. Not sure if this one works for a Japanese audience. This Japanese and Korean word means "pride" or "self-respect." The first Kanji/Hanja means oneself. The second can mean revered, valuable, precious, noble or exalted. And the last Kanji/Hanja means heart, mind and/or spirit. While these characters make sense and hold the same general meaning in Chinese, this is not a normal Chinese word. This selection should only be used if your audience is Japanese or Korean. This is a form of discipline which suggests training of the mind and character, aimed at producing self-control, obedience, etc. One of my Chinese-English dictionaries even translates this as "tempering oneself" or turning yourself into hardened steel. In old Korean Hanja, they use these characters in reverse order but with the same meaning. If you want the Korean version, please click this link instead of the button above: Korean version. When reading an account of some battles in China, I came across this Chinese word. As it turns out, it's only used in military circles to describe neat, orderly, and well-disciplined troops. Perhaps this is actually closer to the meaning I was taught while in the U.S. Marines. The first character literally means stern, serious, strict, or severe (it can also mean "air tight" or "water tight." The second character means exact, in good order, whole, complete, and orderly. Together, these two characters multiply each other into a word that expresses the highest military level of discipline. This Japanese word for discipline relays the ideas of keeping order, observance (of rules, laws, regulations). 規律 is also a word in Chinese and old Korean Hanja where it suggests that you are one who follows a certain law of behavior, or have a regular and dependable pattern of behavior, personal regime or rhythm. 鍛練 / 鍛錬 is the Japanese Kanji and Korean Hanja word that is used for discipline. This has a meaning like "forging or creating something from lots of training and practice." My Japanese dictionary translates this as, "tempering, forging, hardening, disciplining, training." 鍛練 / 鍛錬 is for Japanese and Korean only. In Chinese, these characters might be translated as (physical) "exercise." The modern form of the second Japanese Kanji looks like the first image to the right. There's also an alternate modern form after that, and finally, an alternate traditional form. Because calligraphy is an art, the calligrapher could choose any of these possible forms. Let us know if you have a preference. Gentleness is moving wisely, touching softly, holding carefully, speaking quietly and thinking kindly. When you feel mad or hurt, use your self-control. Instead of harming someone, talk things out peacefully. You are making the world a safer, gentler place. These are the virtues used by Choi Kwang Do Martial Arts. The characters shown here are the ancient Korean Hanja form of writing. If you wish for a Korean Hangul form of these tenets, we can arrange that with our Master Calligrapher Xing An-Ping (click on the Hangul next to the South Korean flag above to order this in Hangul). 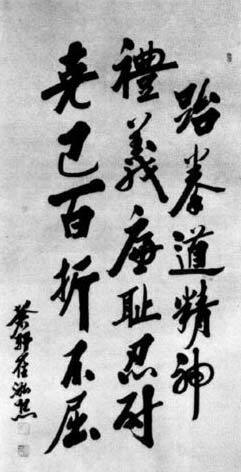 This is General Choi's writing that is often called "The Tenets of Taekwon-do." The actual title would be translated as, "Taekwondo Spirit" or "The Spirit of Taekwondo." It was originally written in Korean Hanja (Chinese characters used in Korea for about 1600 years). General Choi's original calligraphy is shown to the right. Your custom calligraphy will be unique, and not an exact match, as each calligrapher has their own style. Note that the pronunciation is the official version now used in South Korea. However, it is different than what you may be used to. For instance, "Taekwon-do" is "tae gweon do." This new romanization is supposed to be closer to actual Korean pronunciation. After some research, it appears this list was compiled in English based on Taekwondo tenets. We filled in a few of the words that did not have a corresponding Hanja or Hangul. If someone else has a better list with characters included, please contact me. Some people may refer to this entry as Self-Control Kanji, Self-Control Characters, Self-Control in Mandarin Chinese, Self-Control Characters, Self-Control in Chinese Writing, Self-Control in Japanese Writing, Self-Control in Asian Writing, Self-Control Ideograms, Chinese Self-Control symbols, Self-Control Hieroglyphics, Self-Control Glyphs, Self-Control in Chinese Letters, Self-Control Hanzi, Self-Control in Japanese Kanji, Self-Control Pictograms, Self-Control in the Chinese Written-Language, or Self-Control in the Japanese Written-Language. 98 people have searched for Self-Control in Chinese or Japanese in the past year.